I have a slight chocolate addiction. While other people grab for salty snacks I am the one eating a dark chocolate bar. I seem to have passed on the tradition to my two boys who make a bee line to the chocolate bars at whatever store we go to. Since chocolate is my vice I try to limit my chocolate intake to dark chocolate bars and the occasional homemade treat. I love baking at home since I can control the ingredients and I know exactly what goes into every recipe. My kids have been so spoiled that my oldest runs in the door most days asking what I made for his after school snack. One of my favorite chocolate desserts is brownies. Last week I tried a new recipe for Gluten Free Cocoa Brownies from the Food Network. This recipe has 10 ingredients. It takes one hour of total time, 15 minutes of which is active and makes 16 servings. I did make a number of changes to the original recipe. First I used a combination of regular and dark cocoa. I love using dark cocoa in baking it gives recipes a nice slightly less sweet flavor. Since I eat gluten free I used brown rice flour in place of the all-purpose flour. Any type of gluten free flour would probably work, so if you prefer sorghum, white rice flour etc. it should come out similarly. Instead of baking the brownies in a 8 inch pan I used a 13 x 9 inch glass baking dish. There was way too much batter for a smaller pan and using the larger size was perfect. Since my pan was larger my baking time was increased by approximately 5-10 minutes. My family doesn't love most gluten free treats. Oftentimes they turn out dry or too moist. 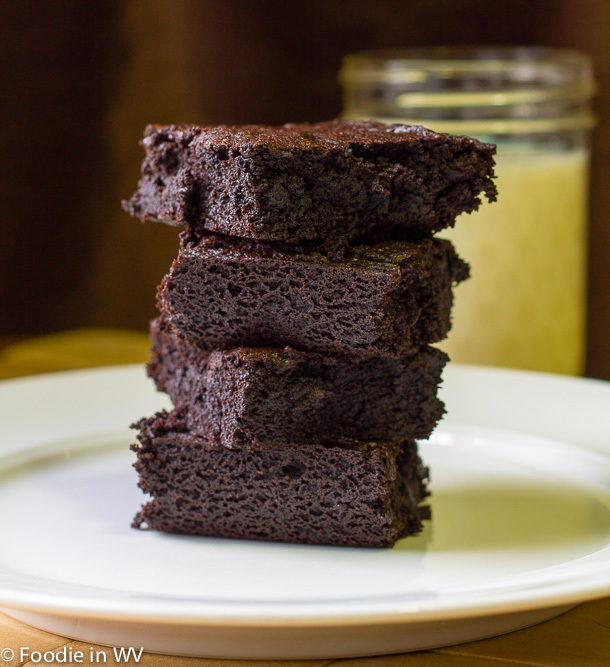 These brownies turned out great and my whole family loved them. I like that the recipe would work well with or without gluten which is nice. The actual texture of the brownies is a nice cross between a fudgy and cake brownie, not overly moist, but not too flaky. I would definitely make this recipe again. You must be a great cook. Everything always looks so delicious! OMG! Those brownies are calling me:-). My G+ for you. Thanks :) They really are delicious! Your brownies look incredible! Totally irresistible! Thanks, they really have a great chocolate flavor! Oh man, those look absolutely delicious!! Thanks :) They really are good even after being converted to being gluten free. Thanks for the sweet comments :) They really are good and very chocolatey, which I love! I could never live in your house. You would make me 300 pounds! I don't eat brownies all the time I promise :) For breakfast and lunch I eat very healthy. Plus I have a treadmill in front of my tv!